Chef Rebecca Boice brings the cult classic restaurant’s simple stylings to the Thanksgiving table with three holiday sides inspired by the season. The Good Eggs team has been advocates-diners-lovers-fans of Zuni Cafe — the humble San Francisco institution with *that* roast chicken and bread salad — since the early days of the company, when our team lunches were pretty much pulled from the pages of the Zuni Cafe Cookbook — simple, produce-forward food rooted in Italian tradition. Fast forward to earlier this year, and we put our love of the spot to good use when we tapped Rebecca Boice, Zuni’s ringleader and current chef de cuisine, to collaborate with us on creating a few Thanksgiving recipe kits in the stylings of Zuni that make use of the insanely good produce our farmers are harvesting this fall. Armed with all the goods in our Marketplace, Rebecca crafted three seasonal vegetable sides rooted in what her parents made for their Thanksgiving table, but updated for a modern holiday with bolder flavor combinations, quicker cooking times, and fewer dishes to clean. (Rebecca, like us, hates dishes). Read up on her inspiration for each dish, and order these seasonal sides for your Thanksgiving table through the links in each header. In my family, there’s always scalloped potatoes for Thanksgiving. I wanted to create a similar dish to fill that comfort niche, but something different than what your mom would do. Initially I wanted to do a potato gratin layered with Early Girl tomatoes, but I guess I was a little too optimistic with the season. We had beautiful apples in the walk-in when I was developing this recipe, and Good Eggs sources from the same orchards, so I swapped the Early Girls for Sierra Beauty apples. I remember my dad always puts cheese on his apple pie — so why not put gruyere in the gratin? I love to eat well, but hate doing dishes — there are a lot of one-pot meals at my house. 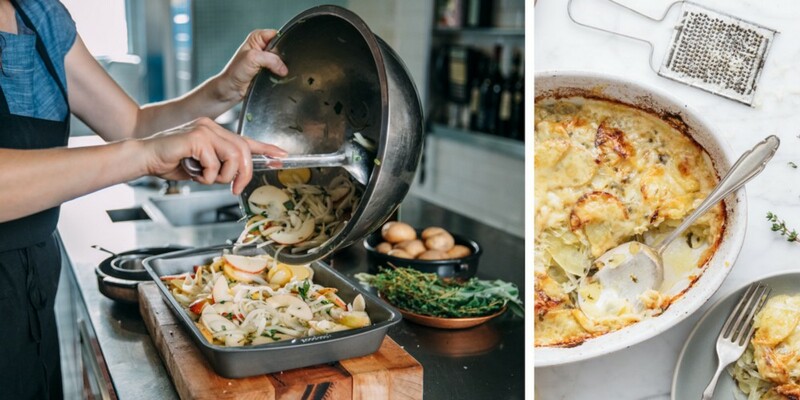 So for this gratin, everything goes into one big casserole dish. You don’t even have to add stock or cream — this gratin is all about letting everything marinate to coax out their flavors. Get this recipe kit here. I wanted to do one side that doesn’t require an oven. The first time I cooked a Thanksgiving dinner in San Francisco, the turkey barely even fit in my tiny apartment oven. After that moment of panic, I figure out one thing to make without an oven each year. Not everything has to be a last-minute scramble — make the vinaigrette a few days before, and assemble everything when you have time. This salad looks beautiful on the table, but doesn’t add any stress to your plate. Get this recipe kit here. Don’t underestimate the pantry! You could make a simple roasted vegetable side, but a few staples from the pantry can make it much more interesting. Agrodolce (translates as “sour and sweet) is a classic Italian preparation of cabbage and onions, but cabbage doesn’t have a huge fanbase, so I swapped in Brussels sprouts (a classic Thanksgiving staple). I also added cauliflower, because roasted cauliflower is amazing and the crop has been tasting really great this season. Throw everything in the oven, make a sweet-and-sour slurry while the veggies are roasting, and then combine the two! The dish is good right out of the oven or served at room temp. Get this recipe kit here. Click on the headers to order these kits developed by Zuni’s Rebecca Boice for your Thanksgiving table.